TRACE NUMBERS AGES 3-5 PRESCHOOL Handwriting Workbook (Volume 1). UPDATED FROM 0-20. This COLORFUL TRACE NUMBERS Workbook is perfect for preschoolers, nursery children, 3-5 year old children to develop the fine motor control they need for the future. 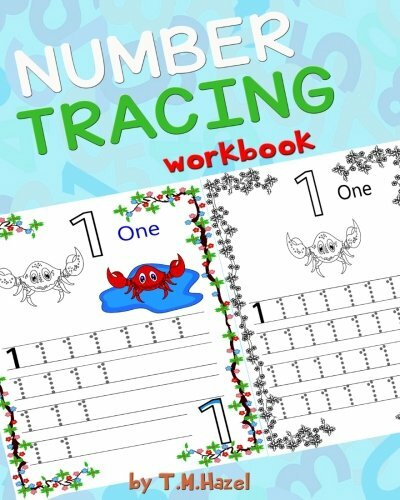 This Number Tracing Book for Preschoolers was designed to help children learn their Numbers, Learn Counting and write them as well. IT is packed with a LOT of Tracing and Colouring!!! This Workbook is a Perfect Tool to practice How to Write Each Number. PLUS the child will be Able to COLOUR the Character that will Help him/her to Memorise The Number Even Better. The purpose of tracing is to help your child to remember the numbers and practice writing skills. Colour Each Number and The Character, then Practice Counting. Remember, children learn best when writing and learning is relaxed and enjoyable so give a lot of praise. Encourage the child to repeat the numbers and after trace so he/she can remember them better. If the child finds it difficult to trace the numbers, show how to trace them first. Visit My Author Page to Learn About More MY PRESCHOOL ACTIVITY Books.